By Melanie Judge and Gabrielle Ritchie. 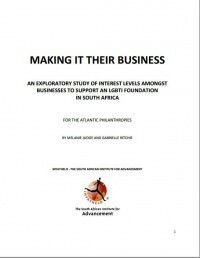 The objectives of this Atlantic Philanthropies study were to assess the extent to which LGBTI-owned businesses and local or multinational companies are likely to provide sources of funding for an LGBTI Community Foundation. It explores the levels of knowledge, attitudes and practices of LGBTI-owned businesses and local or multinational companies with regard to social investment in general; corporate social investment (CSI) and the key factors that influence social investment decisions; and engagement with, and understanding of, LGBTI issues. The study then makes recommendations to Atlantic as to how the Foundation might raise money from within the business sector.